I also have new videos queued up over the next few months on foods to treat acne (barberries), improve athletic performance (fennel seeds), and strengthen our bones (almonds). If you don’t want to wait, all of these videos are available now as a digital download as part of my new Latest in Clinical Nutrition volume 29 (all proceeds go to charity). It can also be ordered as a physical DVD. I also cover how to treat infant colic, counter the inflammation of aging, increase happiness, prevent gout attacks, fight lupus, and regenerate Coenzyme Q10 naturally. 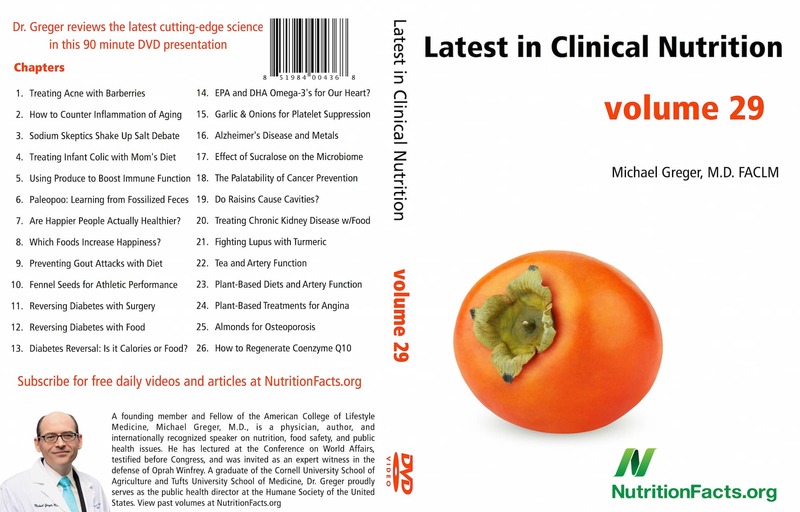 The current batch of videos from volume 28 are about to run out on NutritionFacts.org. So, starting next month and running until April, I’ll roll out the videos from this new DVD, volume 29. The DVDs give folks the opportunity to sneak-preview videos months ahead of time, watch them all straight through, and share them as gifts, but there is nothing on the DVDs that won’t eventually end up free online at NutritionFacts.org. If you’d like the works—50+ hours of video—you can get the complete DVD collection. If you were a regular supporter, you’d already be a Splenda expert by now, having already received the new DVD. I come out with new DVDs every 9 weeks. If you’d like to automatically receive them before they’re even available to the public, please consider becoming a monthly donor. Anyone signing up on the donation page to become a $15 monthly contributor will receive the next three DVDs for free (as physical DVDs, downloads, or both—your choice), and anyone signing up as a $25 monthly contributor will get a whole year’s worth of new DVDs. If you’re already signed up and didn’t receive your volume 29 yet, please email DVDhelp@NutritionFacts.org and she’ll make everything all better. We’re creating an official NutritionFacts.org App! We were inspired to do this given the remarkable popularity of the little “Dr. Greger’s Daily Dozen” app (available free for Android and iPhone) some generous volunteers created for How Not to Die. I’ve gotten such nice feedback from people who are finding it useful, so we’re going to be working on adding new features to that as well. I realize it’s not enough to just lay out all the science. That’s why we’re trying to come up with new ways to help you incorporate healthier eating into your life as seamlessly as possible. After four weeks on the New York Times Bestseller list, it looks like How Not to Die may soon become an international best seller too! It is currently being translated and scheduled to be published in Albania, the Czech Republic, Denmark, France, Germany, Holland, Israel, Italy, Japan, Mongolia (! ), Poland, Portugal, Russia, Spain, and the UK with offers pending in Slovakia and Sweden.